With winter dragging on, Valentine’s day ahead, and spring on the horizon, I am thinking pink. I’m eager for it’s sensuality, vitality, and charm. In her lighter, brighter versions, pink is such a flirt. She’s a coy, coquettish version of red; a siren luring you to sensual pleasures. After these last months of bundling myself in sweaters against the teeth-chattering temperatures, I welcome her seductive warmth. Magenta is one of my favorite versions of pink. An alluring purplish-red, more luminous than true red, magenta exudes luxury. The color itself seems to have a texture of damask, or silk, or perhaps taffeta. Indeed, the Victorians reveled in fabrics colored with newly discovered synthetic dyes of magenta and fuchsia. Think hot pink, neon-pink. Geraniums, cyclamen, fuchsia, primroses, orchids, peonies, and bougainvilleas are but a few of nature’s blossoms that seduce with magenta. Most publications printed in color use a four color printing process referred to as “CMYK.” The “M” stands for magenta. 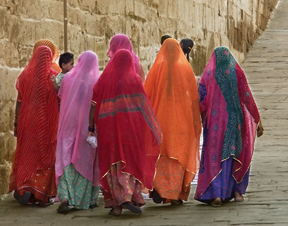 Magenta is responsible for every printed color that has a reddish tint. 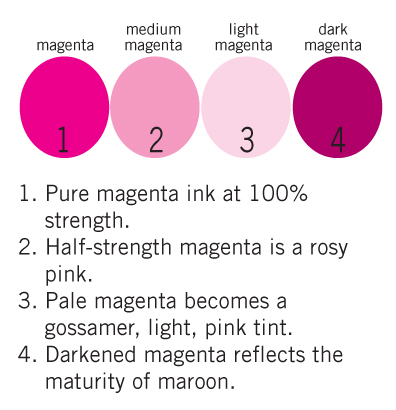 Magenta is the “red” primary of printer’s inks. As a primary it creates brighter, more luminous oranges, purples, and violets than does its red counterpart. Magenta and most pinks pose one major problem. They are insufficiently lightfast, especially in the medium of glass beads. Many magenta and pink glass beads will fade from exposure to cleaning agents or sunlight. Test beads for lightfastness by setting a bowl of them in the sun for a few days. If the beads are to be worn, wear a strand against your skin for a few days. Many dyed beads will not pass these tests as dyed beads are coated with color which can rub off. Glass beads, however, are impregnated with pigment, which produces a more stable color. Because it is often an unstable hue, you won’t find many natural materials for jewelry in shades of magenta (though some rubellite tourmalines come close). Wood, shell and howlite beads are dyed in shades of magenta. Glass, or plastic if you want a less sophisticated look, is the best way to charge your work with magenta and fuchsia tones.